This class is an educational level program designed upon learning basic skills correctly and then building upon those skills. 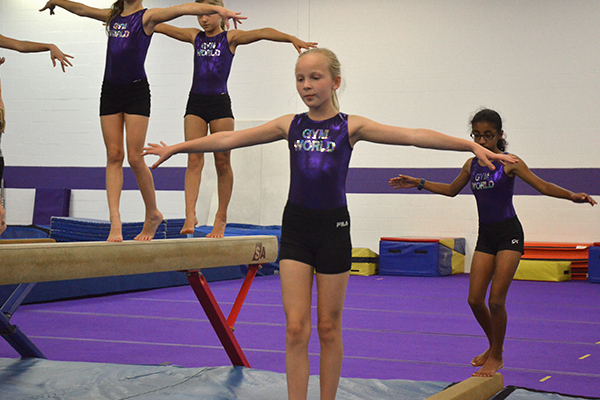 This 1 hour and 30 minute class is designed to enhance your gymnasts skills on Vault, Uneven Bars, Balance Beam, and Floor Exercise. Girls may earn different colored ribbons as they master new skills. Class meets 1 1/2 hours per week for a 9 week session. Click here for more information about our Rainbow Program. $40 annual family Recreational Membership fee and class tution due prior to first class of session. The League Team is designed to give any level athlete a chance to enjoy the competitive side of gymnastics. - 3.5 hours of training per week. One 1.5 hour Rainbow Class and One 2 hour League class. - Get the experience of real competition without the commitment of year round training! - Meets are held in-house with local participating gyms. - Perfect for levels 1 through 3 or athletes training for Xcel Gymnastics. *To participate in League Team you MUST be enrolled in a Rainbow Class. Online registration will be available March 14th. Spring Session runs Wednesday, March 27th through Monday, June 3rd. *Note - we will be closed for classes April 17th through April 20th and Monday, May 27th.